Aviation Updates Philippines - Dubai-based airline giant Emirates finalized a US$16 billion Airbus A380 deal from Airbus for 36 aircraft. This deal, which includes 20 firm orders and 16 options, was signed on Thursday, January 18. EXTENDED LIFE. The new orders for the Airbus A380 will definitely extend the existence of the Airbus A380 programme. Photo by Emirates. “Emirates truly represents Dubai’s spirit of growth, innovation and resilience. It also epitomises the city’s increasing role in connecting the world in terms of people, capital and information flows. This deal reflects Emirates’ confidence in shaping the future, and its commitment to advancing Dubai’s vision to grow further as a world-class destination and aviation hub,” His Highness Sheikh Mohammed bin Rashid Al Maktoum, Vice President and Prime Minister of the UAE and Ruler of Dubai said in a press release. He added that the new jumbo jets to be delivered starting 2020 onwards will be used as aircraft replacements for the older models. The A380 program is a great success for the airline. 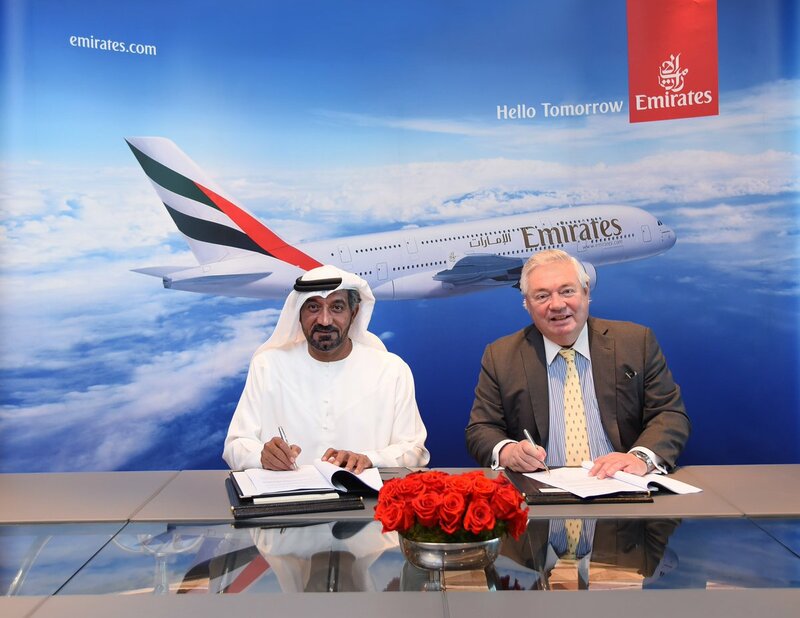 The memorandum of understanding (MoU) was signed on Thursday with Airbus Sales Chief, John Leahy and His Highness Sheikh Ahmed bin Saeed Al Maktoum, Emirates Chairman and Chief Executive at the airline's headquarters in Dubai, UAE. The new orders are on top of the existing 142 A380 deal it made years ago. Emirates is currently the unbeatable largest Airbus A380 operator in the world. Currently, 101 A380 aircraft is on its fleet with 41 remaining orders. "I would like to thank Emirates, Sheikh Ahmed, Tim Clark and Adel Al-Redha for their continued support of the A380,” said John Leahy, Chief Operating Officer Customers, Airbus Commercial Aircraft in Emirates' press release. While airlines are continuing to scrap its jumbo jets from its fleet, Emirates is still on the lookout for jumbo jets and proved the A380 to be economical for the airline's operations. This might spell out the extension of the existence of the Airbus A380 programme. Philippines should have new and large international airport so that Philippines will have Airbus A380 operations particularly by Emirates. Halos lahat ng Asian destinations ng Emirates lalo na ang mga katabing bansa ng Pilipinas tulad ng Singapore, Malaysia, Thailand, at Taiwan ay Airbus A380 at ang Pilipinas ay napag-iwanan na. Dapat nga kahit sa NAIA ay may biyahe ng Airbus A380 upang mapaganda ang imahe ng NAIA na isa sa mga "worst airport". Pero kung anu pa yung maganda na ay yun pa. F**k Emirates.